‘They did not know it was impossible, so they did it.’ This quote from Mark Twain would represent the Buskaid project, born in 1992 in the township of Soweto in South-Africa. It was at this time that Rosemary Nalden, a professional viola player from the UK began to teach music to young black people living in Soweto where poverty is part and parcel of everyday life. The success arrived after a few years of existence, and now the Buskaid orchestra does concerts all over the world and breaks prejudices about poverty. 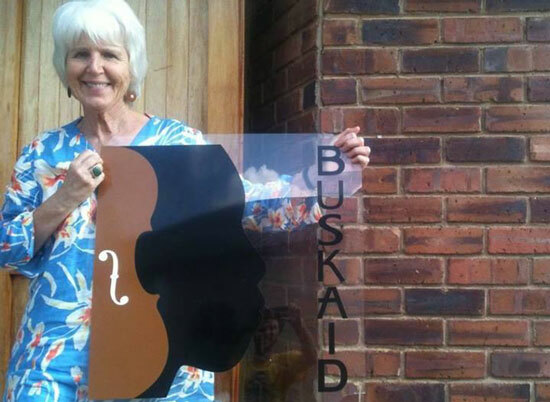 Rosemary Nalden, founder of Buskaid. 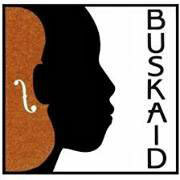 Why music has a positive impact on the young black people who come to Buskaid? “For me, because I am a musician, I believe in the power of music to transform people’s lives, especially in this country and very especially in this city [of Johannesburg]. It is a city of money, of industry, of energy directed towards material things, we have to nourish the soul of South Africa. I think that part of the soul of South-African lives in the musical talent of the townships. What inspired you to created Buskaid? “I was listening to a BBC news programme on a radio in London in 1991, and unusually I heard the sound of a string orchestra. I turned the sound of my radio up, and discovered that it was an orchestra from Soweto. In the early 90s South-Africa was very much in the news, and I was fascinated to learn of the existence of an orchestra in Soweto! After some researches I discovered that this project was struggling to funds itself. So, I asked my professional musician colleagues if they would like to be involved in a fundraising event. They were all very interested and keen because musicians do care about other human beings. We went out and we ‘busked’ in London and Paris! “‘Busking’ is going out in a public place like a railway station and asking people to get money in return for playing music. I used this money to buy some of the equipment which I thought they want it here. I brought that equipment in a big suitcase out to South-Africa a month after the busk, in April 1992. Now, how does Buskaid work? “We built a music school, which is about to extend because we have so many children coming here. At the beginning it was very difficult to get white teachers to come down from Johannesburg, because the perception in those days was that it was too dangerous to come to Soweto, and for some people it is still the same perception today. I managed to attract only one permanent white teacher who joined us in 1999, and she is still with us. We couldn’t manage to take all the children who wanted to come here. So, we decided to train the older musicians from within the project as teachers. We now have an army of very skilled young black string teachers helping us! At the same time we have a number of ensembles and the top one travels overseas and plays at corporate performances and gives concerts all over the place. The all of Buskaid operates on a system of a family tree: I am the grandmother, and the generations of children who go further down as teachers and performers. Some Buskaid students became professional musicians? “Certainly not all of them do. Some of them have two professions, for example we have a woman who is a top kitchen designer in Johannesburg, she plays the violin with Buskaid and she also sings because she has a wonderful voice! We have a very creative young man who studies fashion design, and he also plays the violin. I encourage them to multitask because I think that is the way the world is going anyway. Do you think that music has a lot of positive impacts on the life o the students? “Absolutely. This is without any question! It has been scientifically proven that children who listen to music, even in their mother’s room, has better learning availabilities. We have noticed over the years that children become much more motivated and focused to achieve academically at school alongside their work in Buskaid. It is a fact. Do you have three words to define the spirit of Buskaid? What was the biggest difficulty since the beginning of this adventure? “The difficulties change as the year’s progress, but the thing with which I have to live everyday in my life in raising money. We give so much employment to so many young people mainly from Soweto in an environment where there is 60% unemployment. I have a responsibility to raise that money to make sure that their employment is sustainable. That is a horrible thing. We cannot live without money and every year our budget goes up. Moreover, at the digital age, children are used to get their rewards very quickly and it is now becoming to be a little bit hard to motivate some of them to train hours by themselves during 12 years to learn how to play an instrument. How do you see your organization in five or ten years? “Please, whoever you are, recognize the importance of music, of education and of community in our lives. Without all those things, the future generations in this country will live very miserable lives. We need to nourish ourselves and our spirit, it is really important.